Cross-linguistic research has shown that languages vary greatly in the way they encode spatial reference. However, it has also shown that patterns can be identified in this variety of linguistic encodings. 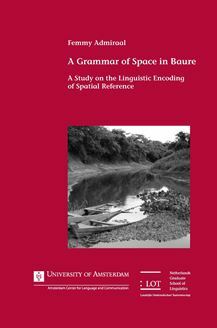 This dissertation focuses on the key components of spatial language in Baure, a critically endangered Arawakan language spoken in the Bolivian Amazonia. Firstly, it offers a detailed description of the linguistic means that are used for spatial reference, focusing in particular on locative noun phrases, predicates used for expressing location and motion, and spatial orientation by means of nominal and adverbial demonstratives. Secondly, the research uncovers the major patterns in the underlying semantics of spatial language in Baure, by studying its use in context. This systematic spatial knowledge is necessary for the correct interpretation of any spatial language. The thesis thus intends to offer the reader a comprehensive overview of the form, function, and semantics of Baure spatial language.